The Panama Finca La Milagrosa Mixto was carefully roasted for you by Portola Coffee Roasters. This fully washed coffee was sourced from the growing region of Boquete, Chiriqui in Panama and was produced by Hector "Tito" Vargas at 1,600 meters. 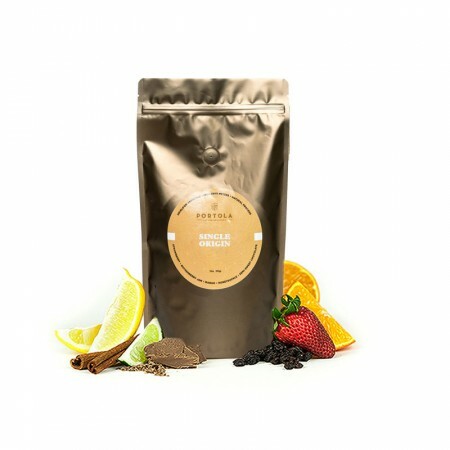 We love this coffee for its nuanced notes of caramel, chocolate, almonds, with a fruited acidity of plums and apricots and a balanced overall quality. Hi Seth, sorry for the overdue reply, I'll give you some feedback. I had to switch to my laptop after siri translated "So the panama plumbing aggressive Mexico"
3.0 (7/28) on bunnzilla: 1.26%, 19%. pistachio, honey, butter. balanced with a long finish. chocolate pops as it cools. 2.1 (5/28) on bunnzilla: 1.39%, 21.3%. overextracted. 2.2 (6/28) on bunnzilla: 1.33%, 20.1%. nutty, honeyed and herbal. a tad muddled. I gave away the blend that I received in the mail first so I can't comment on that. It was good, definitely got the stone-fruit and almond. It almost had a slight spice and caramel sweetness forsure. It was nice to have a taste of home! A good cup. Not a wide flavor profile, but still solid. Great coffee! I always like my chocolate coffee smells when grinding my coffee. With its intense aromatics, this coffee never failed to get company's attention when brewing a pot (and no one was disappointed in their cup of coffee, either). This was indeed delicious and balanced, if perhaps a little bland in comparison to my last selection, the Guatemala El Limonar from Onyx Coffee Lab. I could drink this every day; it's great, but lacks the depth and complexity of taste I was hoping for. I tried it both in the Aeropress and Kalita Wave, and preferred it in the Aeropress. Update: FWIW I like this much more sweetened a bit. I am able to perceive something like plum and apricot that I did not notice before I added 10 g of agave syrup to a 230 ml cup. Can you please just send this everytime? Love this coffee!! This is the bar of quality to keep all my coffees at. To be safe, you can just alternate between this and the Alchemist and I'd be happy. Thanks! I liked this more than I generally like Central American coffees. It had more of a brightness than I expected. I tend toward bright and fruity coffees, so I was maybe a touch skeptical but it was super good. Thanks Seth! This coffee NEEDS to be done in a French Press or something that produces a similar cup (Chemex w/ Able Kone, Clever with mesh filter, etc). I ran it through my Chemex and it's just too acidic - there is no balance. The oils and body a french press or less filtered method allow into your cup are a must for Portola's La Milagrosa Mixto. The flavors really come together to create a balanced cup. On first sip the stone fruit acidity gets toned down by the more nutty flavors and is followed by a wonderful milk chocolate sweet finish. Great cup when brewed correctly! A little too light even for my taste with too much acidity. I don't know what it was, but i didn't really care for this one. I was happy when I was done with it. Too acidic maybe? Not sure. Perfect balance of fruit and chocolate. I'd get this again. There's a weird taste to it. I think it might be bitter? Coffee comes from a berry, but this delicious cup has a strong vegetal taste profile and is roasted in such a way to coax out subtle and delicious earthy flavors -- like slightly charred artichoke or asparagus; maybe I'm overstating the case, as the flavors are not nearly so strong as these vegetables, but there is a noteworthy hint of them, and I like it. It's a hearty cup for what I imagine is a relatively lightly roasted bean. I'm not familiar with Panamanian coffee, but this is certainly different in a very enjoyable way. Portola Coffee Roasters continues to satisfy. Without focusing much on the nuances, we simply enjoyed the fullness of this bean. Three cheers for Portola!!! Smooth and creamy. My favorite yet. This coffee has been great. The fruity acidity is really enjoyable and the body is a good balance. This is a phenomenal coffee! There is a lot going on without it seeming to busy. Not too dark, just right. Loved every sip! Excellent coffee, tried different grinds and shorter and longer steeps in the press and couldn't mess it up, always an extremely thick, syrupy body with no bitterness or astringency. Great balance, low acidity and nice oily extraction. Very good. This might be the best coffee I've ever had. Incredibly balanced and drinkable all day. Sad that it's already gone. I've really enjoyed this coffee. It has a very complex fruity flavor, and I love that. It isn't quite as smooth tasting as the last coffee I got, but this wasn't a problem. It is slightly darker than I usually prefer, though it was not bitter nor acidic, which is exactly how I like it (bitterness and acidic isn't my favorite, I mean). I would love to try more Panamanian coffees. From the moment the water touches the grounds, a wave of sweet milk chocolate burst out, nearly overwhelming me. At a coarse grind the coffee brings out a hint of caramel. The body shines bright with fruity acidity that sweeten up the cup. Pretty good. Better than my first. It does feel smooth. this is great in a V60- really balanced and just damn tasty. This had a great flavor with a finish that wasn't overpowering. Complex, earthy coffee. Primary flavors are rich spring greens with a little note of tart cherry. Mellowed a bit between 3 and 10 days after roast. This cup is fruity, with notes of roasted banana and a floral aroma. Quite enjoyable brewed in a Chemex with a ​paper filter. Chocolaty and balanced acidity. Decent cup of coffee. I found the coffee to be hearty and full of subtle chocolate flavors. An awesome cup to start the day with. A really good balanced taste. How one was just ok for me. More earthy without much fruit or brightness or nuance to it. Mostly bland. Another very well balanced and pleasant cup of coffee. Subtle nuttiness is the most prominent flavor. To muted no real acidity. 3.5. Tastes like a s'more - graham cracker, lots of chocolate. Love the chocolatey taste. Amazing cup.